Lockouts, unlawful landlord entry and more. The south side block Donna Johnson called home. Donna Johnson always paid the rent on time in the south side apartment where she lived with her daughter. 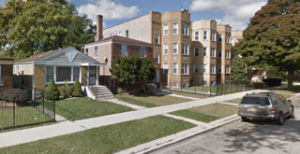 She enjoyed living in the modest three-unit building near Marquette Park. By any definition, Donna was a model tenant and a loving mother. But when her apartment became infested with bed bugs, her landlord treated her like anything but. Initially, her requests for repairs were ignored. Donna made phone calls and even sent letters to her landlord. Eventually, a representative of the landlord would respond, but the response would be anything but professional. On more than one occasion after Donna requested repairs, the property manager showed up unannounced, letting himself into the apartment with no warning. Donna’s daughter awoke one day to find the property manager looming over her as she slept. One day soon after, Ms. Johnson was taking a shower when she heard a noise outside the bathroom. She listened and soon realized the property manager was in her apartment again! He had illegally entered her home, and now he was face to face with Donna, making sexual advances towards her. Feeling shocked, angry and violated, Donna kicked him out of the apartment and called the police. In retaliation, the landlord cut off her gas. Donna was being illegally evicted – because she wouldn’t put up with her landlord’s criminal behavior. That is when Donna called MTO’s Tenants Rights Hotline for help. She spoke with a counselor who explained her rights and how she can document the situation. They spoke about Donna’s desire to terminate her lease and find a new apartment where she and her daughter felt safe. To aid her in this effort, MTO connected Donna with a trusted community partner, the Law Offices of Brian J. Gilbert. Donna brought suit against her bully landlord for illegal lockout, illegal landlord entry, and other violations of the Chicago Residential Landlord Tenant Ordinance. Rather than fight a battle he was certain to lose in court, the landlord agreed to settle. And while Donna has a settlement check in her hand today, she did anything but settle. Donna has a new home, a fresh start, and is free from the fear of illegal lockouts or harassment. Her daughter is happy and safe today because Donna followed through and did what is right. Donna fought for her rights. And she couldn’t have done it with out the assistance of strong community partners like the Law Offices of Brian J. Gilbert. MTO believes safe housing is a human right. We have a number of ways you can lend your skills to make that a reality.